Hoo Wee! 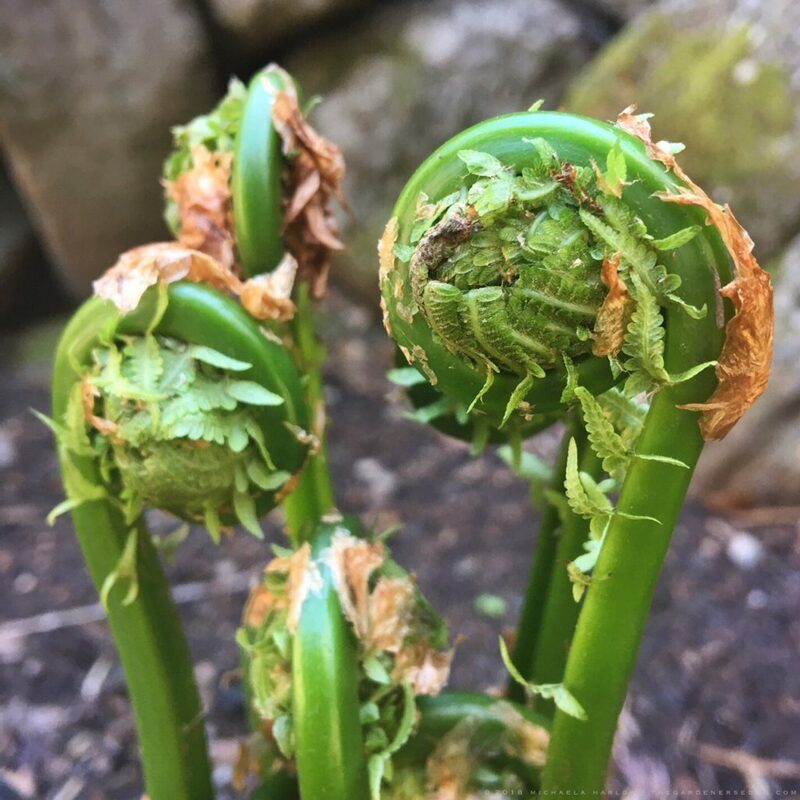 It’s fiddlehead season again in Southern Vermont, and don’t you blink or you’ll miss it. 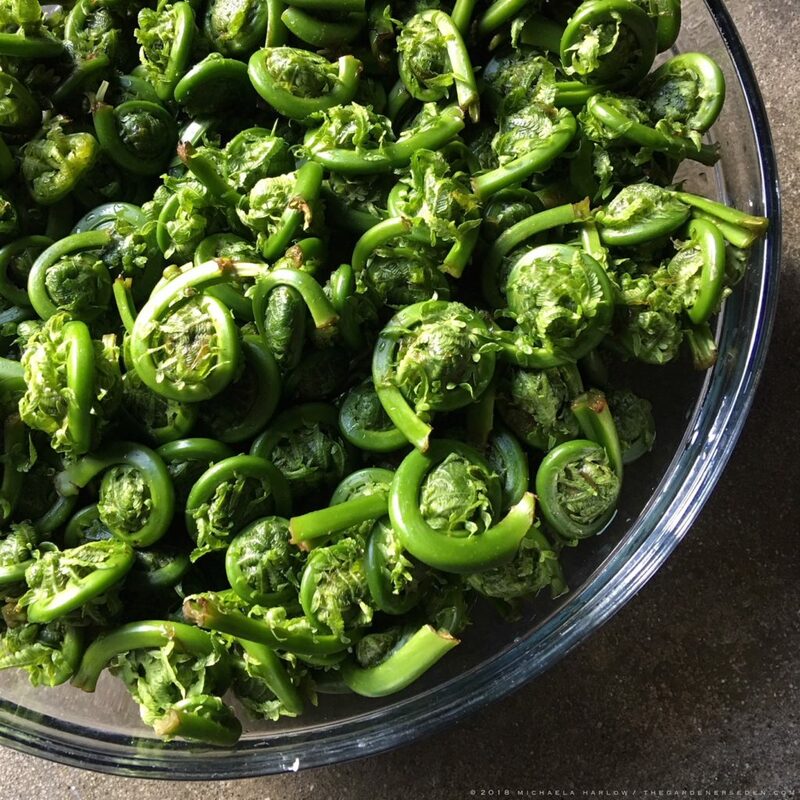 Normally just two weeks long, fiddlehead season is particularly short with spring’s late arrival this year. So when I noticed bloodroot (Sanguinaria canadensis), and troutlily (Erythronium americanum), beginning to bloom on the forest floor, I rushed right out in the early morning hours with a big harvest basket. Time to visit the damp, woodsy lowlands and forest streams, seeking out the tightest, brightest, green Matteuccia struthiopteris fronds. Matteuccia struthiopteris makes a tall, elegant, ground-covering ornamental in damp shade. Hardy in zones 3-7, it can reach 3-6′ high and its spread, by underground rhizome, can lead to 6-8′ colonies. This is a great plant for naturalizing in a high understory, and for pairing with spring ephemerals; such as Sanguinaria canadensis, Erythronium americanum, Phlox divericata, Tiarella cordifolia, and woodland bulbs of all kinds. By late spring, Matteuccia struthiopteris makes a lovely, softening backdrop and filler plant toward the back of the border. It’s a great plant for pairing with ephermerals and early-blooming bulbs. 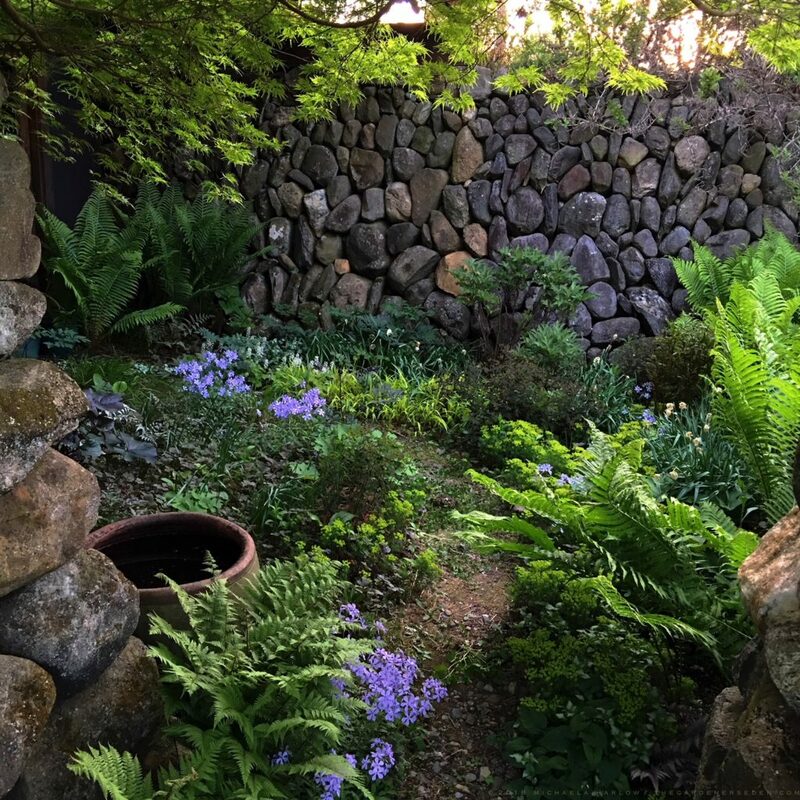 Although I cultivate Ostrich Fern in my secret garden, it also grows wild here in the Vermont woodlands surrounding my studio and home. When I go out foraging for fiddleheads, I look for the deep green, shiny curl of Matteuccia struthiopteris. 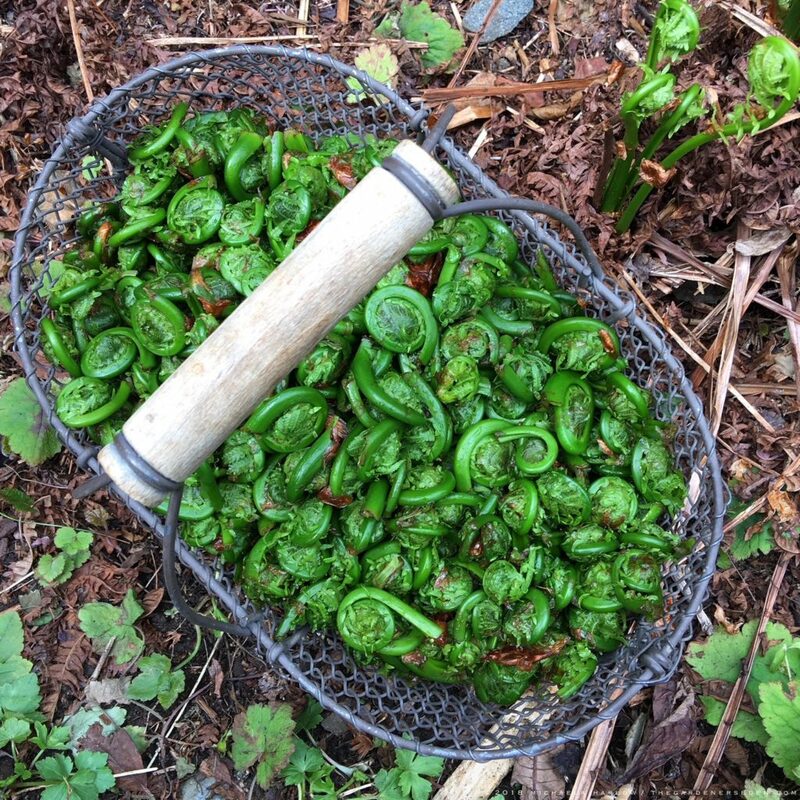 Often, the fertile, dark brown, spiky fronds —which persist, tough and upright, through the winter months— lead me to the emerald green fiddleheads at the base of each fern. I’m careful to harvest only one or two from each plant. After Harvest, I Soak Fiddleheads in Cold Water, and Rinse Thoroughly to Remove Sand and Brown, Papery Husks. Once Cleaned, Steam for 7-10 Minutes or Blanch for 10-15. Then, Use in Salads, Stir Fries and Pastas or Bag and Freeze for Later. Ostrich Fern fiddleheads should not be consumed raw. Instead, after thoroughly cleaned (see instructions above), be sure to steam (7-10 minutes), or blanch (10-15 minutes), fiddleheads to al dente. Once steamed or blanched, these delightful greens may be eaten in a variety of ways. Toss them in a simple soup or salad, sauté in butter as a side dish, add them to favorite pastas and risotto or enjoy them in savory tarts and quiches. Cleaned and sealed in airtight bags, raw fiddleheads will keep fresh several weeks in the fridge. Once steamed or blanched, they may be bagged and frozen for up to 9 months. Article and Photography copyright Michaela at The Gardener’s Eden, all rights reserved. All content on this site, (with noted exceptions), is the property of The Gardener’s Eden and may not be used, reproduced or reposted elsewhere without written consent. You are currently browsing the Foraging category at The Gardener's Eden.